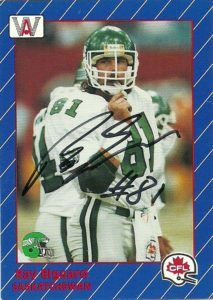 After playing at Utah on scholarship as a tight end, Ray Elgaard returned to Canada to play for the Saskatchewan Roughriders. A second round pick in the 1983 draft, Elgaard was 6’3″, 220, which made him a mismatch for many of the defensive backs that were currently playing in the league. He not only had soft hands and the speed to play slotback in the league, Ray also could just bowl over defenders en route to the endzone. He’d have a pretty soft rookie season, but after that, the rest is stuff made of legend, as he recorded 8 1,000+ yard seasons over a 14 season stand with the Roughriders. His best season came in 1990, when he recorded 94 receptions for 1,494 yards and 11 TDs. He’d also pull down 11 TD receptions in both 1991 and 1992. Ray retired after the 1996 season. 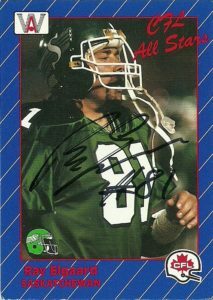 Over his career Elgaard was named an All-Canadian 3 times, and the Outstanding Canadian in the CFL in 1988, 1992, and 1993. At the time of his retirement, Ray was the career league leader in receptions and yards. He was inducted into the Saskatchewan Roughriders Plaza of Honor and into the CFL HoF in 2002. Elgaard also was named one of the CFL’s top 50 Players in 2006. Retired, Ray lives in Las Vegas and works for a brokerage firm. All-World 1991 was quite an ugly card set. They looked like they were trying to spoof the ProSet 1989 set hard. They just put diagonal pinstriping on the cards. Yes, the red was hard to read on the blue cards, and the CFL logo was easier to read than the team logos that just looked sort of stuck on there after the fact. It also didn’t help that the photos were not always action shots, which left a curious speculative collector such as myself really confused. The WLAF scored a coup when the Orlando Thunder was able to lure longtime firebrand head coach Don Matthews to the league. It immediately gave the league some credo in its attempts to stave off the future CFL invasion into the USA. After spending time in the military, Matthews had some stints coaching at the high school and college level before emerging in the CFL in 1977. There he joined the Edmonton Eskimos led by coach Hugh Campbell and quarterback Warren Moon. The team went on to win 5 consecutive Grey Cup Championships before Don was hired to coach the British Columbia Lions. He’d turn the doormat into a Grey Cup contender, marking their first appearance in some 20 odd years. The Don brought the cup home to the Lions in 1985 as he won his first coach of the year honor. His teams always employed a smash mouth defensive style and his players loved to ‘walk the way he walked’. 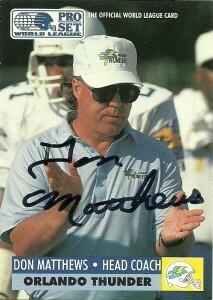 He coached the Lions through 1987, before his stint in the WLAF in 1990. Don’s 1990 team was uncharacteristic of his CFL entries. The team had a powerful offense led by Kerwin Bell, but their defense was trashed by most teams, leading to a 5-5 record in Matthews’ only season in Orlando. 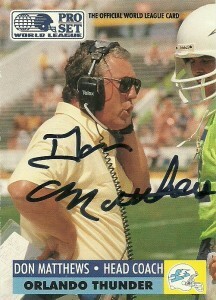 Don returned to the CFL after the season and coached for the Argos, before hopping over to Saskatchewan through 1993. As the CFL invaded the US market Matthews became the head coach of the Baltimore Colts/ Stallions. He’d earn coach of the year honors back to back as the Stallions won the Grey Cup. Don returned to the Toronto Argonauts from 1996-1998, before sweeping back to the Esks from 1999-2000. Again in 1997 this time, The Don earned another coach of the year honor as his team won back to back championships in 96 and 97. He’d be best remembered by many fans for his time in Montreal guiding the Alouettes, – a team that lived and played as hard as Matthews did, to another championship in 2002. After a year off from the sport, Matthews coached one more season in 2008 for Toronto. His 231 wins are only second to Wally Buono in CFL history. Living in Oregon, Don has handled anxiety most of his coaching career. He was inducted into the CFL Hall of Fame in 2011 as a ‘League Builder’. A special thanks to DemonXXX on the sportscollectors.net message board for helping me find this one. UPDATE 6/14/17– CFL Hall of Fame coach Don Matthews passed away today at the age of 77, after a 4 year battle with cancer. An incredible wide receiver talent, Allen Pitts played collegiately at Cal State Fullerton. 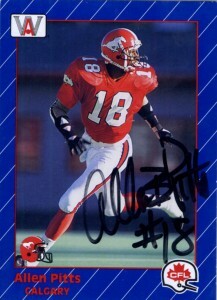 Drafted by the Stamps in 1990, Pitts would dominate the record books for the next 11 seasons for Calgary. Pitts was a fan favorite who was considered an enigma by everyone. While other players put down roots during the off-season in Calgary, Pitts would return to the LA basin. Players considered him the team jokester, with an extremely private side and because of this nature, he was quickly a target of the media. His rookie season would start off quite nicely with 1100+ yards receiving and an 18 ypc average. He’d go on through the next 10 seasons logging 8 more 1,000+ yard seasons receiving, including a club record high 2036 yards in 1994 to go along with 126 receptions and 21 touchdowns. Considered extremely competitive, Pitts retired while his career was still in its prime, -and after another 1000 yard season in 2000. At the time of his retirement, he was a 6 time All-Star, the CFL’s All-time leader in yards receiving, touchdowns, and receptions, (since surpassed), most 100 yard games (64), and was the first player in league history to record two consecutive seasons of 100+ receptions. Inducted into the Stampeders Wall of Fame in 2005, his jersey retired by the team, the CFL Hall of Fame in 2006, and named #10 on the greatest players in CFL history, Pitts’ current whereabouts are sketchy, but it is believed that he still lives in the Los Angeles area and older data suggests that he was working in a construction business. A great TTM prospect acquisition at that time in 1992.